Little Bit had a sleepover the other day – it was her best friend’s birthday and she went to her house to help celebrate. While she was gone, Big Girl was at a little bit of a loss as to what to do. With no little sister to pester, I guess she didn’t know what she should be doing. So, I asked her to help me in some kitchen experimentation. Together, we made some new dishes – completely from scratch. It was fun and we made a huge mess in the kitchen – and ended up with some yummy treats in the process. I’ve been wanting to make my own hummus for a while now. I’ve been collecting recipes and ingredients and I was ready to give them a try. So, we pulled out the food processor and became mad scientists – mixing and tasting and mixing some more. This is one of the recipes we started with. And there was another one that was a source of inspiration, but we truly just made it up as we went along. (I can’t find the other one, sorry) I think we quadrupled the amount of garlic it called for and we added some roasted red peppers to ours, too. Our final result was truly yummy. I was surprised that Big Girl wanted more cayenne! (and more and more and more) Her palate is truly expanding and it’s fun to see her finding new tastes that she likes – like spicy hummus! We also made baba ganoush, which is similar to hummus but made with roasted eggplant. I had tried some when I went to dinner with my brother in June and loved it. I have to admit that my baba ganoush was not quite as good as the one I had in June, but it was pretty good nonetheless. And, I was especially proud of Big Girl, who made this one all by herself and happily dipped and tasted once she was finished with her concoction. The pitas tasted really good and we’re enjoying dipping them into the hummus and baba ganoush. It’s a great afternoon pick-me-up when it’s too late for lunch and too early for dinner. Healthy fats and good protein to carry us through until dinnertime. I think we will try the pita baking another time, too, but it’s simply too humid right now to successfully bake breads. It’s like trying to bake in a steam room. Not good. 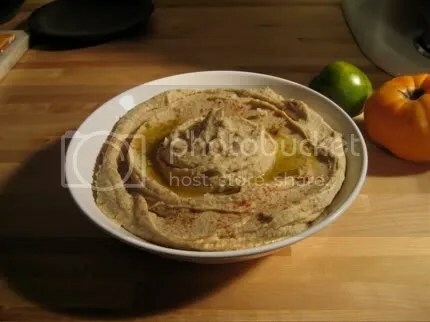 Here is the link to the baba ganoush recipe we used. Since I don’t consider what we made perfected, I am not going to share my own recipe just yet. If I get it perfected the way I like it, I’ll post later on. But this was our base recipe. And here is the link to the pita recipe we used. It is so basic and so simple, I encourage you to try it. If you have flour, salt, water and yeast, you can make pita. And the rolling out of the little pitas is actually pretty fun. Our recipe made about 18 pitas that were about six inches in diameter. So, let me know if you try it out! It was so much fun to mix and drizzle and roll and bake (and taste!) with my Big Girl. Getting the girls in the kitchen is so much fun – it takes cooking from being a chore to being an adventure… and teaches them some new skills, too!